Since it was just announced, I don't think that we have a discussion thread for this one yet, but if we do somehow, please forgive me. For whatever reason, I can't get over the fact that this seems to be Disney's take on the whole "villain is the main character" thing that "Despicable Me" and "MegaMind" both already did. Now, granted, those movies didn't involve video games, but you know what I mean. I do like the cast. Sarah Silverman's humor may be very adult in nature, but she does seem like she has a great voice for animation (she already did a good job with a recent guest spot on "The Simpsons"). And the visuals are sure to be interesting, with Disney getting better and better at computer animation with each film they put out. Plus, the video game worlds will probably be cool to look at. Not likely going to happen but, will there be a reference to Super Mario Bros 3 in this? yeah, I instantly thought Megamind when I read the summary..
^ Snow queen got shelved last time I heard. Mort(discworld) was next on the list(Although I can assume it would have came out after Wreck it ralph) but it got shelved due to disney not getting the rights. But there is some fanbase trying to get Disney to bring back the project. Dacey wrote: For whatever reason, I can't get over the fact that this seems to be Disney's take on the whole "villain is the main character" thing that "Despicable Me" and "MegaMind" both already did. Now, granted, those movies didn't involve video games, but you know what I mean. "Joe Jump"'s been around LITERALLY longer than Rapunzel/Tangled, and the plot had to be constantly updated with every new title to reflect the changes in the videogame industry. They were married to do this one next (out of the other reclamation/"salvage" projects like Bolt and Tangled), so they may have considered it a conveniently coincidental plot shortcut to compare themselves to Other Nice-Villain Movies, but it's got a longer history than those other two movies combined. Mmmmm...I have to say this doesn't leap out as anything that could be super-cool. Sure, they could get jiggy with the 8-bit visuals and CG imagery and stuff, but it sounds like a cross of what's already been mentioned and a kids' Tron-ish type of thing. Good to see Disney doing more than just what we expect, but this doesn't sound like anything groundbreaking. And, seriously, with everything Lasseter must be getting pitched (some of hit just having to be on a Pixar level) and he picks this? It doesn't matter about the long history: perhaps even more of an argument to say "leave it alone, someone else has already taken the meat off these bones". Sometimes, films that go on for ever aren't meant to be made. PS: I'm sure in a year's time (wow, just a year!?) I'm going to be eating my words and loving Wreck-It Ralph, despite the bad title! When I first read the title, I was hoping it might have something to do with The Mouse and the Motorcycle / Runaway Ralph, by Beverly Cleary. I was thinking the Rotten Ralph series. At first this was called "Joe Jump", then "Reboot Ralph", and was apparently originally about a video game hero who transcended to the worlds of newer video games and had to deal with all that. That sounded better and less Dreamworks-rip-offing to be sure. And what is with Disney and awful titles lately? Wish there was a teaser out too though. 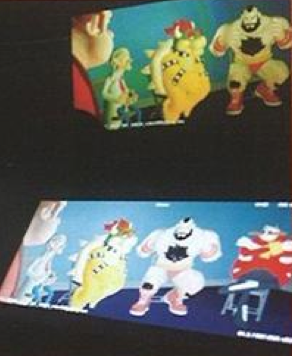 It's blurry, but from left to right: Wreck-It Ralph, Wiley from Megaman, Bowser from Super Mario, Zangief from Street Fight, and Robotnik/Eggman from Sonic the Hedgehog. And they're obviously not just parodies like I assumed would be in the movie. Disney clearly got permission to use ACTUAL video game characters in this movie. And that makes me really excited. There seems to be a lot of you that seems unsure about this movie in the thread. I say read the D23 article and you might get more interested in it and see how much work they appear to be putting into it. So the trailer is finally out. what does everyone think of it? Quite frankly, I'm more excited about this movie than Brave, and can't WAIT for it. It looks like a lot of fun, they've got great voices, and the creators clearly love video games based on all the cameos (some of them pretty obscure, like the rhino from Altered Beast). Pretty cool that the various game companies allowed them to use their characters.